The design for this playground was conceived during a design workshop for students on board a ship plying the Rhine. 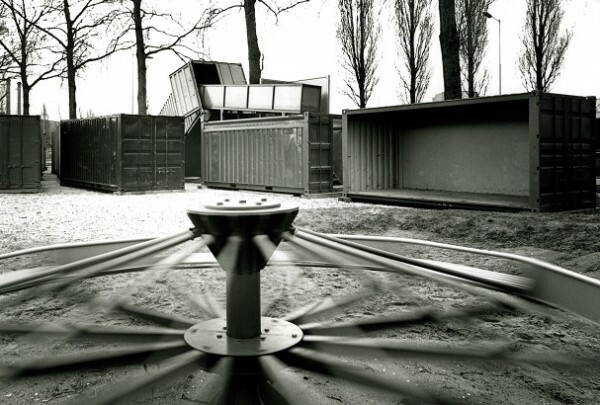 The three conditions were that it could be built in one day (Opzoomerdag, a day to celebrate social renewal in Rotterdam), that it should exploit imagery and material referring to port activities and the nearby RDM wharf in particular, and finally that the themes of play there should be 'courting danger and seeking the limits of what is possible'. The result on site is certainly an exhilarating, chaotic labyrinth, little of it premeditated and resembling more than anything else the unplanned frayed edges of town where children like playing best.